“Mutant foods” appear to be all the rage right now, from Dominique Ansel’s cronut to Keizo Shimamoto’s Ramen Burger. San Francisco-based Sushirrito, which serves a “sushi burrito” is a natural evolution of that trend, one born from necessity. Years ago, founder Peter Yen worked downtown in San Francisco and found himself craving sushi for lunch, but did not have time for a sit-down meal. Nagged by a growing concern about overfishing that was decimating the seafood population, Yen began to dream up a new way to consume sushi that was fast, fresh, affordable, portable, and environmentally conscious. The sushi burrito was born. 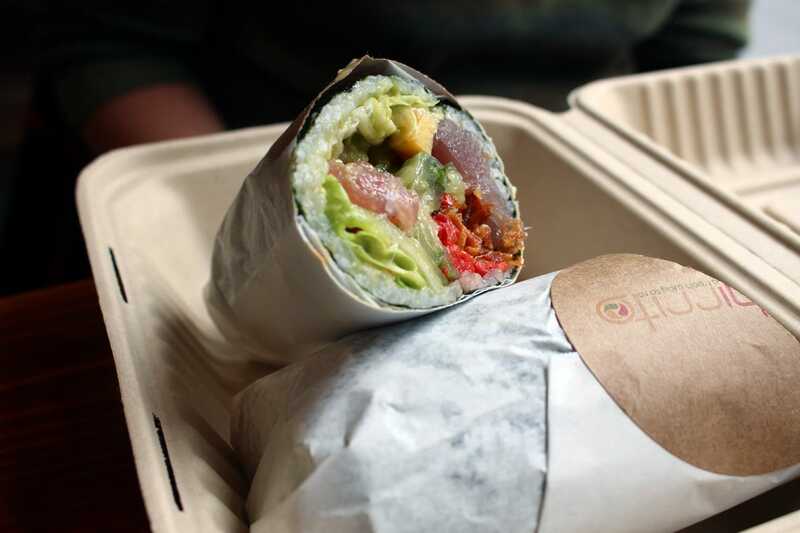 We stopped by Sushirrito’s Union Square and FiDi locations in San Francisco to try the latest culinary phenomenon. Though it takes the shape of a burrito, the sushi burrito definitely tasted like a fresh sushi roll. It was served chilled, for one thing. And each bite offered a distinct flavor and texture. The oven-baked salmon fell apart in my mouth, the pickled cucumbers burst with juiciness, and the rice and avocado provided a welcomed blandness. This may look like a typical cinnamon roll found in the States, but don’t be fooled. If you’re like me, your mouth salivates at the thought of a delicious cinnamon roll (fresh and warm out of the oven…cooled just enough for the glaze to not drip off…I really want one now). The above cinnamon roll, however, is not something many people in the U.S. are familiar with. That’s because it’s a Swedish cinnamon roll. And it has cardamom. And less sugar. And no frosting. Wait. Hold up a sec. Not as witty as “I’m sick of these motherfucking pastries without the motherfucking glaze”, but it still works. Cardamom– Yes, they are cinnamon buns, but most Swedish recipes call for an absurd amount of fragrant cardamom as well. No icing– Too much sugar also drowns out the butter and spice flavors and in American buns this often comes from icing. Swedes opt for little crystals of what’s known as pearl sugar instead, which looks suspiciously like pretzel salt. I’m not totally knocking the American buns, which are good in their own way if done right, but the Swedish kanelbullar are delicious on a whole different level. The pearl sugar and cardamom can present an obstacle, as cardamom is often sold in pods here and pearl sugar simply doesn’t exist in most American grocery stores. I suggest heading to your local spice shop and pick up either high quality ground cardamom or the seeds to grind at home. I get mine at Epic Spices. It goes without saying that good-quality cinnamon will make a difference as well. The pearl sugar can be acquired online or at the Swedish-American Museum. The Lars’ Own one also has a simple recipe with cup measurements and only two rises if this one is too complicated for you. The recipe for these blasphemous pastries can be found at the link. The cheese comes from Rogue Creamery in Oregon. While inspired by the practices in Basque and Provencal, Rogue Creamery has made something entirely their own. Rogue River Blue is made only with summer milk, which many find superior in flavor and texture for certain cheeses because of the animals’ fresh diet. The cheese is decked out with local Oregon offerings, wrapped in Carpenter Hill Vineyard Syrah leaves that have been macerated in Clear Creek pear brandy, imparting a rich, boozy savor. After being lovingly hand-wrapped, the cheeses are aged in facilities built to simulate the Roquefort caves in France, but imparting molds local to Rogue River Valley’s terroir. This cheese isn’t kidding around. This cheese is here to party. Because of its seasonal nature, Rogue River Blue makes its annual debut in early autumn. The festive leaves and bright paste of this beautiful cheese call for celebration and indulgence, as does the hefty price tag of $42.99 per pound and up. Take your jaw off the floor: this cheese is worth it. The aroma is boozy and fruity, while the paste is velvety and soft like set buttercream frosting but with crunchy granules within the pockets of blue. It tastes like lemony fudge, with secondary flavors of yeast, spices and mission figs. Serve it with something a little sweet, like local honey, fig jam and port or barley wine. 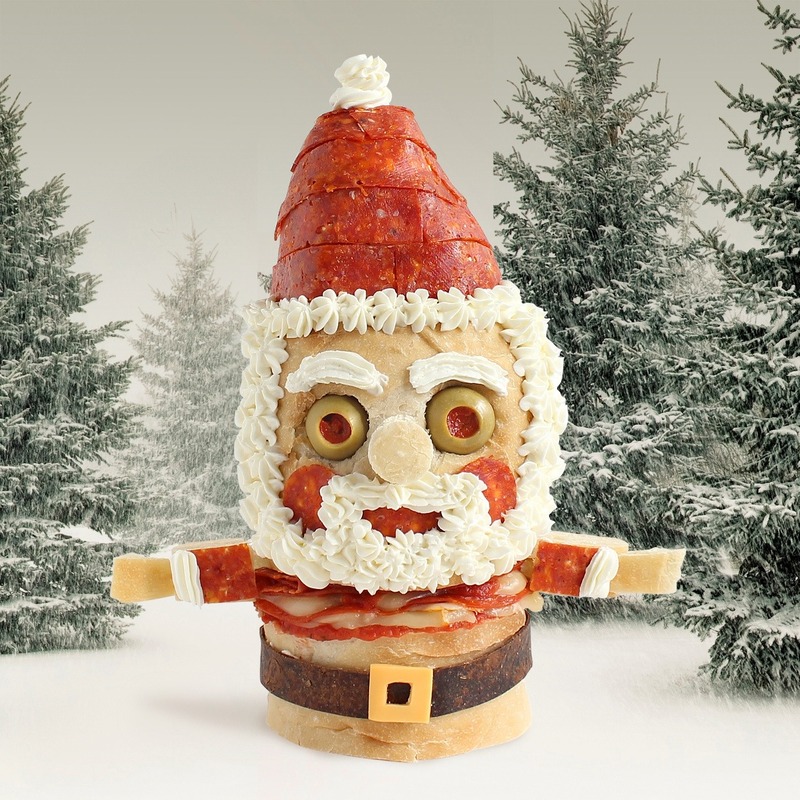 Pepper-HO-HO-HO-ni // Oscar Mayer Heritage Recipe Pepperoni with cheese, marinara, and cream cheese. And will someone eat those nasty eyes? Olives. Blech! On a recent trip to Malaysia, Avicenna (one of the many great bloggers at Freethought Blogs) set out to find and eat durian fruit. Regarded by many people in southeast Asia as the “king of fruits”, the durian is distinctive for its large size, strong odour, and formidable thorn-covered husk. The fruit can grow as large as 30 centimetres (12 in) long and 15 centimetres (6 in) in diameter, and it typically weighs one to three kilograms (2 to 7 lb). Its shape ranges from oblong to round, the colour of its husk green to brown, and its flesh pale yellow to red, depending on the species. The edible flesh emits a distinctive odour that is strong and penetrating even when the husk is intact. Some people regard the durian as having a pleasantly sweet fragrance; others find the aroma overpowering and revolting. The smell evokes reactions from deep appreciation to intense disgust, and has been described variously as rotten onions, turpentine, and raw sewage. The persistence of its odour has led to the fruit’s banishment from certain hotels and public transportation in Southeast Asia. Yep. I ate Durian. And here is the thing? It wasn’t that bad. Okay the smell was strong. It wasn’t nauseating but it smelt a bit like rotting vegetation. It was pervasive. Just having it in the car had me go “that’s a strong smell”. It managed to get everyone in the house realise we had bought a durian and indeed come down to eat it. Let us just say Hera and her family REALLY like the fruit and I can see why. So in this trip I ate a Durian Custard Pastry, Some Durian in a Roll and a fresh Durian. The smell was strong in all of them. You could tell it was durian and I have a strange feeling Hera wanted me to try it so had told various people to get me anything durian to try. But the taste. The smell is a little off putting but I had one advantage. I had smelt worse things. Much much worse things and we will look at those things on a later date. A little sweet and cloying and strong, but the taste. It tastes amazing. It’s like a custard tart type of texture and sweet but not too sweet. There is a slight savoury taste to boot. I was sold on the prepared stuff and I am sold on the actual fruit. I would encourage everyone to try it, but I know the problem is the smell. India’s various odours may have helped inured me to the fragrance and the taste may put people off. Maybe some people are sensitive to it. IF you would like to reward my culinary foolhardiness then please do so by donating to ASTI. We are donating as open atheists and skeptics from FTB so if you wish to be seen and heard as atheists who do charity then pass the word. Sadly there are no videos of me eating Durian but if I do go in season? We can do that too! If you have some spare cash, maybe you can donate.